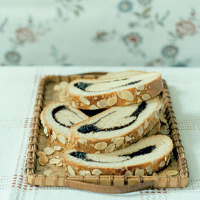 This rich and buttery bread or cake is based on the Romanian recipe Cozonac, which is traditionally made on Christmas Eve and at other times of celebration throughout the year. Mix the flour with the yeast, sugar and a pinch of salt together. Add the butter, eggs, vanilla extract and about 2/3 of the milk and work together, gradually adding enough of the remaining milk to form a soft dough. Knead for 5–10 minutes until beautifully smooth and silky. Return to the bowl, cover with clingfilm and leave in a warm place for 2-3 hours or until doubled in size. For the filling, grind the poppy seeds finely in a coffee grinder, food processor or pestle and mortar. Place the milk and sugar in a medium pan, then bring to the boil over a low heat, stirring until the sugar has dissolved. Stir in the poppy seeds and cook for about 3 minutes until very thick. Cool for a few minutes then stir in the butter and chocolate. Leave to cool. Preheat the oven to 180°C, gas mark 4. Grease a baking tray. Knock back and knead the dough for a few minutes. On a floured surface, roll out the dough into a 22cm x 30cm rectangle. Spread the filling over the dough, leaving a 1cm border around the edge. Roll up tightly, place on the baking tray, cover loosely with a damp tea towel and leave in a warm place for half an hour to rise. Brush lightly with the egg yolk and water glaze and scatter over the flaked almonds. Bake for 40–45 minutes until firm and golden brown. Cool on a wire rack, then cut into slices to eat.